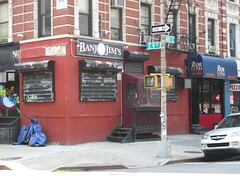 Both Mr. Ceraso and a representative from Banjo Jim’s confirm that the bar has not been sold yet. Mr. Ceraso said that he and his partners hope to win approval for a liquor license before finalizing a sale agreement with the bar’s current owner, Lisa Zwier-Croce. Ky Hote, the webmaster at Banjo Jim’s, said that nothing has changed at the bar. “A deal isn’t done until it’s done and right now we’re focusing on business as usual,” Mr. Hote said. Ms. Zwier-Croce seems to have accepted the potential sale in spite of her emotional attachment to the music bar. 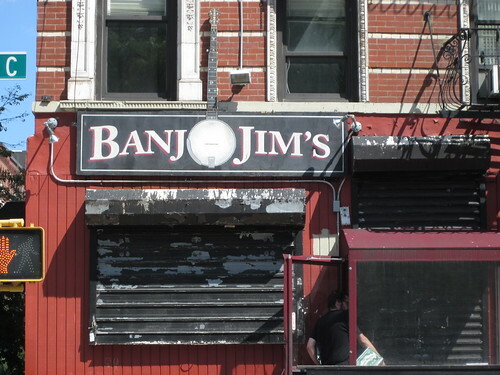 “I’m sad to let go of the business it was a really personal venture for me I opened Banjo Jim’s honoring my husband who passed away. For me it was about the live music that was my whole heart was in opening this place. But you know, it’s been tough in a couple of different ways and we need to move on and these guys are really down to earth,” said Ms. Zwier-Croce. She said that people are understandably concerned about change, they are focusing on a trivial detail. If the sale does go through, which both parties expect to happen, Mr. Ceraso said that he plans to alter the bar but to embrace what he feels is the beauty of the area. The spot holds sentimental value for Mr. Ceraso, 37, who held his wedding reception in the park directly across from Banjo Jim’s. He was quick to point out that, while he and his wife have “homesteaded” and moved out to Jersey City since having two children, he grew up in the area; his wife is from Avenue D, and his parents used to own a clothing store called ENZ’s on St. Mark’s Place. His partners in the venture are Tim Falzone — a friend from high school who also owns the bar White Noise on 14th Street — and Jason James. Mr. Ceraso said that he and Mr. James’ passion for food is what is driving their use of homemade (yes, East Village, he calls them “artisanal”) jams and bitters in their cocktails. While nothing is finalized, Mr. Ceraso is already experimenting and has developed an apricot chipotle jam, an apricot ginger jam, and a sour cherry jam. The name is also under consideration. Their working title is James Daniel, a combination of Mr. James’ last name and Mr. Ceraso’s middle name, but they now think that might be a source of confusion with the famed bourbon. Another possibility is Willows Keep, as an homage to the trees in the neighboring parks, but there are pitfalls with that as well.